Karpathos, between Rhodos and Crete, was apparently first occupied by the Minoans and the Dorians. In the 5th v. BC it was a member of the Athenian League and enjoyed great prosperity. 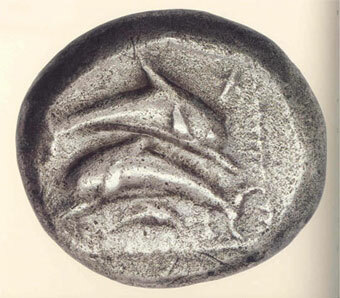 To Karpathos is attributed an Archaid silver stater (500BC) depicting two dolphins swimming in opposite directions, while a third, smaller dolphin swims alongside them. The depiction is enclosed in a square. The harmonious movement of the dolphins recalls the staters of Thera From this same period. 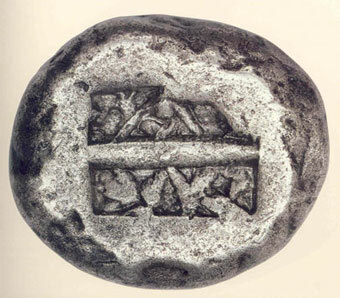 The attribution of this rate coin to Karpathos has been disputed by many scholars, but its technique is indisputably Karian.